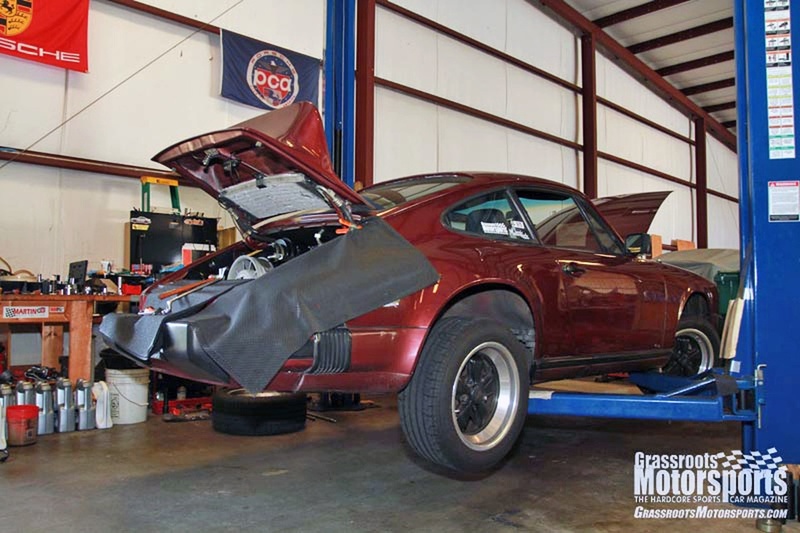 We picked up our 1984 Porsche 911 Carrera from Aero Dynamics, and guess what? The air-conditioning blows cold. Seriously. Lou, the proprietor at Aero Dynamics, updated our system from the original R12 refrigerant to the newer R134 juice. Doing so meant replacing the drier, flushing the compressor, and installing new O-rings. He also installed a little baffle to add some efficiency to the rear condenser, while the front one got a new motor for its cooling fan. Since there's a bit more to the process, we'll detail this one fully in the magazine. We also need to record some real a/c vent temperatures for you guys. We can say that on the way home we passed a sign that read 93 degrees, yet we were cool and comfortable. While the car was there, he also performed our post-rebuild maintenance: adjusted the valves, retorqued our ARP head studs, and refilled the engine with Brad Penn oil. Our airflow meter also needed to be reset as someone had monkeyed around with it. We had picked up some new Bosch spark plug wires, so he installed them while the car was on the lift. How this for smart shopping: Those plug wires list for more than $200, with street prices hovering around the $175 mark. Amazon listed them for $148--score, or so we thought. Then we noticed used ones for $114. "Who sells used spark plug wires through Amazon?" we thought. Turns out it was an open-box deal from Amazon. We grabbed the one set listed, and other than some shelf wear on the box they looked great. Since the 1984 Carrera seems to be a one-year only application for plug wires, we considered this to be a major, major score. Lou also installed a fresh set of Bosch Super Plus sparkplugs--a solid, copper-core plug. These retail for less than $2 each, so they're easy on the old wallet. Oh, and not only does the air blow cold, but the car runs awesomely. We'll get more data and details soon. Footnote: Aero Dynamics doesn't have a website, but you can phone them at (386) 304-0380. They're located in Port Orange, Florida.